8 teams will be competing for the chance at the title currently held by the defending champion Pin Pals. The league will be a handicap league with an individual point system in place. Team previews and more details to follow. What? You didn't actually forget about Eugene from season 1 did you? Eugene was the Pin Smackers smooth bowling lefty, who paired with Abhi to form one of the best 1-2 punches in the league. Eugene came in and averaged 168.8 pins in the winter, which was 7th best overall. What makes Eugene top-10 worthy was his consistency; he never let up after a good game, he just kept them coming. He easily matched up with any team's #2 bowler. Like many others on this list, Eugene shined in the playoffs, kicking up his game and scoring consistently over 185. When Eugene gets going, expect to see the championship belt pose (a la Aaron Rogers and Steve Novak). But besides the one gesture, expect nothing else. Eugene is one of the quieter bowlers in the league. Besides being one of the most experienced bowlers in the league, Eugene holds another advantage over most of the league. As a natural lefty, who shoots as a lefty should, his lane conditions will be more consistent than any righty bowler. The oil on left side will wear down much slower, since he's the only one shooting on that side of the lane. This means once he finds his spot, he's going to be locked in for most of the match. Eugene's a finesse bowler. While he avoids splits, he doesn't strike too often either. That could be the one 'downside' of his game. However, he also converts his spares at a higher percentage than basically anyone in the league. So his lower strike total is essentially negated. With better competition coming in this season, expect Eugene to take his game to another level. Get ready for a ton more belt poses this season. Top 10 Player Power Rankings Begins! In anticipation of the start of the fall season, SABowl will be doing a power rankings (in reverse order) of the league's 10 best bowlers. The rankings will be spread out over the next few days, to allow (possible) commentary. 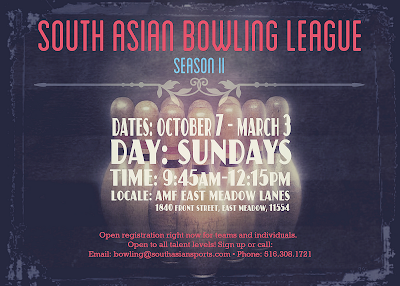 Anyone who bowled in summer or last fall that is bowling this season was eligible for the top 10. 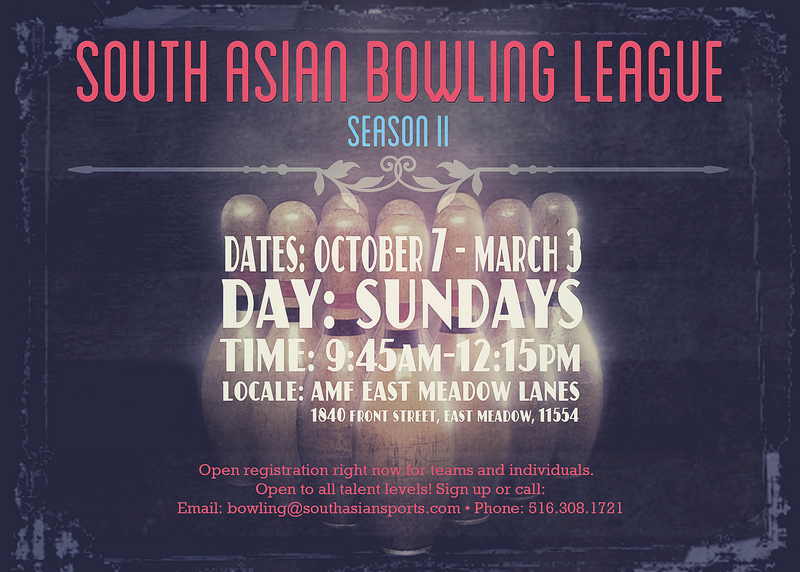 Email bowling@southasiansports if you want to post comments agreeing/disagreeing with a particular ranking. Note that these rankings are not meant to disparage anyone and are supposed to be fun. Also note that a preference was placed on bowlers who bowled last fall since the season was longer. Gage came on in the summer for the Four Horsemen and averaged 170.4 pins for the season. His high was a 235, and his high series was 595. Gage thrived as the team's lead-off bowler, welcoming the challenge of going first and setting the tone for the team. In addition, Gage welcomed the challenge of facing the opposition's highest handicap players. Gage would enter a game down 40-50 pins, and got the job done nearly every match. Where Gage really shined was in the playoffs. Ask anyone on the Four Horsemen, and they will say Gage was the MVP of their playoff run, and with good reason. Gage was the team's most consistent bowler - bowling no game under 190, while striking out in the 10th frame in 2 different games. Talk about bringing your A game on the grandest stage. Gage throws a good hook with some power to it. When he's on, he can really strike with the best of them. When he's on fire, expect the 'flex pose' just after he throws the ball; which means you are big trouble. The only knock on his game is that he can lose some focus if he misses a few spares, but he has improved on that as the summer season went on. Expect Gage to be higher on this list as the season progresses.